For decades, researchers have sought to elucidate how breast cancer develops. Though it is the most common cancer in women worldwide, scientists still puzzle over the exact causes of the disease. When scientists discovered a gene potentially increasing risk of breast cancer in 1990, researchers hoped to engineer cancer treatments by understanding how the gene worked. The gene’s name was BRCA1. On the surface, we can only observe the physical symptoms of cancers affecting millions every year. Delve deeper within the body, and it becomes clear how on the cellular level the growth of malignant cancer tumors severely weakens organ systems like the immune system. Zoom in one final step, and the root cause is revealed: the genes we are born with are intricate yet delicate structures that can be impacted by the environment or through their own replication. Changes in these genes indicate a system gone wrong and can result in rampant cancerous growth. Over the last twenty-five years alone, since the BRCA1 gene was discovered, about 70 million women have been diagnosed with breast cancer and ovarian cancer. The BRCA genes play a significant role in cancer growth, but scientists have never been able to explain exactly why and how. The number of people who are affected by cancer is increasing and our time is dwindling. Dr. Patrick Sung (PI of the Sung Lab) and associate researcher Dr. Youngho Kwon. Image Courtesy of Sung Lab. Fortunately, researchers in the Sung Lab at Yale, led by Patrick Sung and Weixing Zhao, have tackled the problem by developing their own techniques to discover the function of BRCA1 and its interaction with other genes during tumor expression. Despite failures in other labs for years, the Sung lab was certain that given the right amount of experience, time, and careful work with the genes and proteins of interest, they would be able to build upon previous research to further study the elusive gene in a novel way. BRCA1 is a gene that produces proteins that prevent cells from multiplying uncontrollably—a process responsible for eventually forming a tumor. Although the gene has been studied extensively over the last two decades, it has remained a mystery exactly which proteins BRCA1 is responsible for expressing and how it interacts with other genes like BARD1. We do know that the protein made by BRCA1 is involved in a process called DNA repair, in which it interacts with other molecules to find damage within a molecule of DNA and then repair it. This process is critical to normal cell function because, when mutations arise, whether accidentally or through environmental factors, our bodies require a mechanism to fix the errors in DNA before the DNA can be used to produce flawed or unwanted proteins. In normal humans, there will be two copies of the functional BRCA1 gene present—one from the mother and another from the father. As an accumulation of natural mutations or environmental factors such as radiation constantly damage DNA, one or both of the copies of the gene that coordinates repair may have mutations or be destroyed. If this occurs, it is very likely that the DNA repair mechanism to suppress tumor growth will be unable to function normally, and there is a high likelihood of cancer arising. Among people who inherit just one functioning copy of the BRCA gene, chances are that over the years, the functioning gene will be lost due to environmental damage, and being devoid of the remaining functional BRCA gene can eventually lead to cancer. Mutations in both of the BRCA genes, called BRCA1and BRCA2, are associated with all forms of cancer but are most strongly linked to breast and ovarian cancer. While it is still a debate why mutations in these genes primarily affect these two types of cancers, some believe that gene expression-related stress is higher in cells where breast cancer originates. Estrogen-responsive genes, such as the ones in breast and ovary tissue, are therefore more susceptible. ngagement of the BRCA1-BARD1 complex in homologous DNA pairing. In this issue, Zhao et al. reveal novel attributes of BRCA1-BARD1 and a previously unrecognized role of this tumor suppressor complex in the homologous DNA pairing reaction catalyzed by the RAD51-ssDNA presynaptic filament during HR-mediated chromosome damage repair. 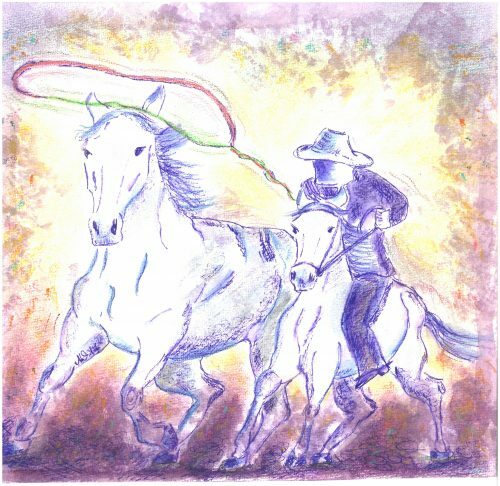 In an analogy, Lasso is BRCA1(red)-BARD1(green), cowboy is the recombinase RAD51, large horse is homologous DNA, and small horse is single-stranded DNA resected from double strand breaks (DSBs). Image courtesy of Antje Wiese, Caption courtesy of Sung Lab. BRCA1 has been a mystery for so long in part because the protein encoded by the BRCA1 gene is large and complex, containing many components that make it difficult to work with. The first main challenge in the scientists’ research was purifying the protein itself. Proteins, in comparison with other macromolecules such as carbohydrates, are much more unstable due to their various components and ability to denature, or become inactive, in suboptimal conditions. Sung says it took several years to finally design a method to not only express a very large protein but also work with the protein without rendering it inactive. Researchers had to work quickly and gently with the delicate proteins in a room with a controlled temperature in order to preserve the proteins in their functioning state. Leaving the protein in a high or low temperature environment or leaving it out for longer than about half an hour could denature it to the point where it could no longer be studied. Their novel approach allowed them to express a thousand-fold the amount of protein that was previously possible. After overcoming this obstacle, the team was set on further studying the proteins. But there was still one missing piece to the puzzle – the BRCA-BARD1 complex required a helping hand in performing their DNA repair task. The team hypothesized that the BRCA1-BARD1 complex works with an enzyme called Rad51 because they observed certain properties in protein factors that suggested a cooperation with Rad51. To test their hypothesis, they induced DNA damage in BRCA1 and then placed purified proteins, including Rad51, in a test tube to determine whether the DNA repair system worked. If the DNA repair mechanism was only successful in the presence of Rad51, then that proved their hypothesis that Rad51 indeed was the enzyme that cooperated with the complex to carry out DNA repair. They were able to conclude that Rad51 recognized the damaged DNA and paired it up with an undamaged molecule of DNA to initiate the DNA repair reaction. Furthermore, the BRCA1-BARD1 complex is essential to the DNA repair reaction—when the complex was unable to form, the repair did not take place, and mutations affecting either BRCA1 or BARD1 decreased the effectiveness of repair. Patrick Sung said that his passion for research originated in his intellectual curiosity and realization as a college student that cancer was a huge problem that needed to be cured. His ultimate goal is to develop drugs that target specific known pathways to treat cancer, and despite the large strides this recent paper represents in the field of cancer research, his work is far from done. After the discovery of the cooperation between BRCA1, BARD1, and the Rad51 enzyme, it still remains a question how BRCA1 and BRCA2 function together. BRCA2 is also a part of the DNA repairing complex, but it is not as clearly understood as BRCA1. With their novel approach to successful protein purification, these researchers hope to reconstitute the larger complex including BRCA2 and determine its relation to cancer formation. Moreover, they are interested in understanding how mutations work so that they can find a basis for using compounds in cancer treatment. 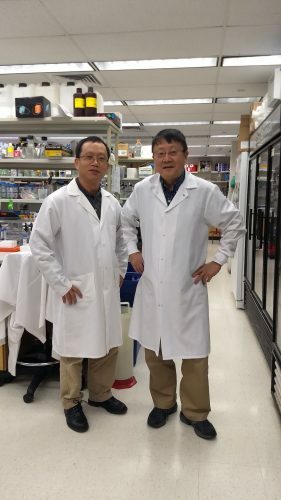 While many questions remain, it is likely that both the Sung lab’s discovery and their technical contribution to the protein purification process will lead to progress in treating cancers. Now that researchers know how the protein factors of BRCA1 function, they can test them in combination with other genes to see if they can make cancer cells more susceptible to available cancer drugs and determine the efficacy of those drugs—a process that would help physicians optimize their prescriptions for their treatments. On the other hand, they can also use their knowledge of how the genes bind and function to develop new compounds that can regulate DNA repair processes and eventually be used in preventative cancer drugs. In the future, the scientists would like to fully understand the pathways of BRCA genes to the point where, by studying an individual’s genes, they can advise the patient about how likely it is that they will have cancer and when they might be most susceptible to cancer so that they may plan their futures accordingly. The fight against cancer is well and alive, as researchers around the world make strides towards treatments and preventions. As the Sung Lab passionately scrapes away the mysteries of BRCA1, we can be hopeful that we are well on our way towards answers for curing cancer. Leslie Sim is a first year in Jonathan Edwards College at Yale University interested in cancer research and biophysics. She enjoys fencing, food photography, and exploring New Haven streets aside from being a writer for the Yale Scientific. I would like to express gratitude to the Sung Lab at Yale and would like to thank, in particular, Professor Patrick Sung, Dr. Weixing Zhao, and Dr. Youngho Kwon for sharing their knowledge with me in interviews and expressing enthusiasm about cancer research. Zhao, Weixing et al. “BRCA1-BARD1 promotes RAD51-mediated homologous DNA pairing.” Nature, vol. 550, no. 360, 4 October 2017, pp. 360-365.